The Academy earned the Military Advanced Education magazine’s distinction as a top military friendly university for the second consecutive year. The Academy has a long record of being military friendly and helping many service men and women earn their sports-related degrees or take sport education courses, even while serving in Iraq or Afghanistan. The Academy was recognized for its efforts recently by the Military Advanced Education (MAE) magazine, a leading higher education journal for service members. 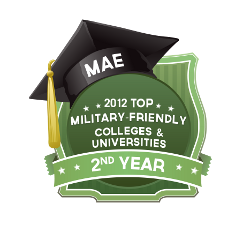 It was the second consecutive year that the Academy earned the distinction that recognizes the nation’s top military friendly universities. Another similar distinction was bestowed on the Academy by G.I. Jobs, the premier magazine for military transferring to civilian life. Active-duty military are able to take courses or earn their bachelor’s, master’s or doctoral degrees 100% online. The Academy, also known as America’s Sports University, uses innovative technology that makes courses accessible 24/7, which allows students to start a course anytime from any place in the world. Another way the Academy has made its regionally accredited education programs more accessible to the military is by slashing its tuition by one-third for active-duty military men and women and those in the “Wounded Warrior” program last year. That means military now pay $250 per credit or $750 per course for a Bachelor of Sports Science degree. In addition, the price is reduced for military by $250 per credit for both master’s and doctorate degrees. The university has worked closely with the “Wounded Warrior” program to deliver its online sport education programs to military personnel, who are ill, wounded or disabled from post 9/11 overseas combat duty. The Academy hosted members of the Joint Chiefs of Staff’s Warrior and Family Services Program in August 2010 to begin providing its courses. In 2007, the Academy Scholarship for Wounded Warriors was created by its founder and CEO Dr. Thomas P. Rosandich, who served 20 years in the U.S. Marine Corp. He kicked off the scholarship after touring the Walter Reed Medical Center in Washington, D.C., where he met with many young, severely wounded American troops. the chance to complete their bachelor’s degree. If students have received an associate’s degree or earned a minimum of 30 semester hours of general college courses at any school, then they can enroll in the Academy’s upper-division bachelor’s program. The Academy makes transferring into the military friendly Academy, as easy as possible. To learn more details about the program go to: ussa.edu/go/bachelors/. Earning a degree can lead to jobs in the sport profession as a coach, athletic trainer or administrator in the future. In fact, about 77% of Academy graduates are currently employed in the $400 billion sport industry. U.S. Army 1st Sgt. Tracy S. Lahr completed his Sports Performance courses last year, while serving in Kuwait. His battalion commander asked him to explain the Academy’s programs to all the other soldiers who were serving there and he highly recommends them.